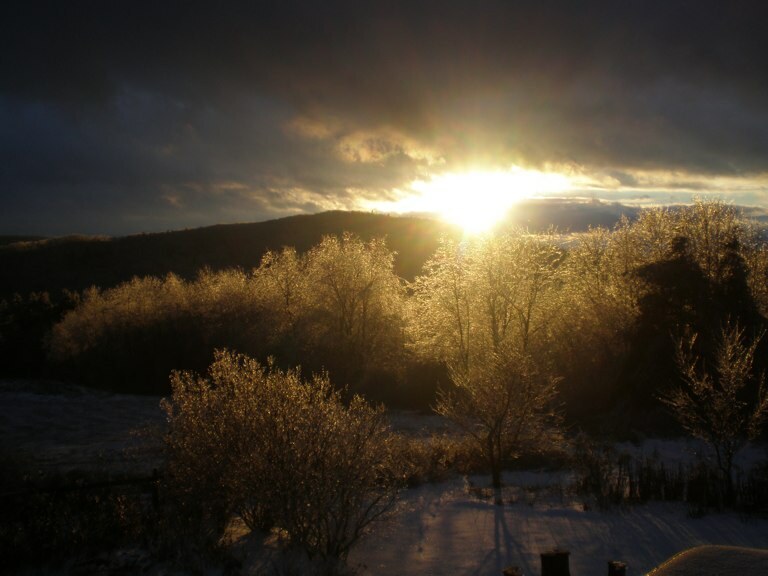 Ice covered our region about a week ago and our community is still recovering. We lost power over the weekend, while half our town lost power for a week. At the farm, the electricity was gone only long enough to give us a deep appreciation for hot water and offer us some peaceful time cooking food on our wood stove and playing lots of Scrabble. The power outage was a lot less fun for most of the people in our town. Everyone down by the Connecticut River had to drain their pipes, move the contents of their freezers out into the snow, haul water from the river to feed their livestock, and take refuge in hotels or homes with power. For all its challenges, it was a crisis in which people took care of each other and the power companies worked twenty four seven to get things going again. Everyone pitched in with kindness. It made me wonder whether this same generosity will rule the day with the other crises we face as a country right now. This week the husband of one of the Green Hope staffers was let go from his work with no advanced notice. He came in to his job and was told to pack up his work station and go. My own husband, Jim, was told that after fifteen years teaching sixth grade social studies and English, he would be teaching seventh and eighth grade math and science next year as a way to lower the school budget. I could walk you though the reasons given for this decision, but think I will dwell on other aspects of this situation. Jim is very passionate about how important it is for sixth graders to have a world separate from seventh and eighth graders. It gives these twelve year olds one more year to be kids, before being blasted by all the peer pressures of an American teen. This new plan will see his sixth grade program swept into a sixth through eighth grade pod with him no longer teaching any sixth graders. He worked for fifteen years to create a sixth grade program that includes such highlights as a curriculum based wilderness program in the White Mountains, a social studies curriculum dovetailing with books read for English, and class scheduling with long class periods to take his students deep into the creative projects he has developed over the years. Today for example, he has his kids involved in a very elaborate treasure hunt based on the constitution. With his fellow sixth grader teacher, he has created a sixth grade year where kids ask to have â€œworking lunchesâ€ so they can keep on discussing Lois Lowryâ€™s â€œThe Giverâ€. In the new configuration the sixth graders lose the White mountain trip, all read alouds, long class periods, recess, and Jim. This is a personal loss for Jim as well. He is passionate about sixth grade and social studies. Fifteen years ago, after a stint in the much more lucrative field of hospital administration, Jim chose to return to classroom teaching, specifically the sixth grade classroom. As he looks down the barrel of a whole new life, he knows that not only does he have to come up with four new curriculums for next year in subjects he has never taught, but he will have only three years to pass the science â€œLeave No Child Behindâ€ praxis test in order to keep teaching the new curriculum he has been given. The praxis science test for a seventh and eighth grade science teacher is a test for 7th-12th grade certification and requires an expertise in all the materials taught in high school chemistry, physics, and biology. Jim has never taught any of these subjects and has not studied them in thirty years. While several years ago he boned up on his calculus to get 7-12 certification in math, he does not feel any grade school teacher he knows could pass the â€œLeave No Child Behindâ€ science test and does not expect to pass it himself. This means he can plan on teaching new subjects for three years, before needing to find a new job. And this is a man who has been in the classroom for twenty three years! Besides needing to let off steam here, my point is broader than our specific troubles. In the days to come, it looks like this sort of sea change is going to sweep over a lot of lives. There are going to be opportunities for all of us to act and react from our most generous centered selves instead of our most fear driven ones. In light of the economy and the way education in New Hampshire is almost entirely funded on property taxes, Jim and his fellow teachers expected reductions in staffing and other changes to come to their school. But they had hoped that they would be given the chance to brainstorm with each other and with administrators and school board members before changes were made. This did not happen. There was no communication or dialog before the changes were mandated. Retroactively, they have asked to be given a chance to come up with some different staffing configurations that fit the budgetary constraints, but better protect the programs. I hope that this will be allowed to happen. All this has me sipping a big glass of water with Eyes of Mary Flower Essence in it. I can get pretty fired up about who did what to whom, but I realize that my only option is to calm down, focus on how I can listen to Jim without pushing my own solution on him, and think how I can practice what I preach in my own life as CEO of Green Hope Farm. Interestingly enough, it was Eyes of Mary that was the Flower that we chose to represent the Green Hope Farm Collection of Flower Essences. Eyes of Mary Flower Essence is all about seeing everything in overview, loving with detachment, and supporting people amidst their trials and tribulations without trying to â€œfixâ€ things. I am leaning on Eyes of Mary right now to help me understand that the situation Jim is in serves his journey, even if, right now, the situation just makes me mad. Itâ€™s a two pronged thing. I want to try not to act from any fear driven place in me that keeps a negative chain reaction going. I want to try and live from the same sort of generous place that prevailed in people in our town this week as neighbor helped neighbor when the lights went out. I also want to try to remember how much I have learned from situations that are just like this situation Jim faces. I need to remember that this circumstance is giving him an opportunity to learn something his soul wants to learn more than his soul cares about job security. To take his teaching life into his own hands and stand up for himself and all he believes in is an opportunity for him to see his own courage in action. I donâ€™t have to fix anything, just bear witness with love. I had a funny dream last night. I was at a library sitting with a young mother and baby. The baby was just a few weeks old but tremendously strong with sparkling blue eyes and a presence that filled the room. She was the new wisdom in a room of old wisdom. In the dream, we knew that something way out to sea had been taken and for some reason we decided to send the baby out to sea to reclaim what had been taken. We set the baby up with a big motorboat. Quite a lot of attention was paid to getting her the right outboard engine for the boat, and then we sent her off, confident that she was the one for the job. I feel this way about this time. We canâ€™t go forward with the tired old wisdom and tools of patriarchy and expect anything to be different. Whatâ€™s broken canâ€™t be fixed by the culture that broke it. But the dream left me feeling encouraged. The new paradigm of the sacred feminine has been born. She may be young but sheâ€™s feisty, talented, and ready to roll. Weâ€™ve got the equipment to support her expedition. And she has already head off to sea to reclaim what was once lost. Thatâ€™s all very good news. Yesterday morning, as a gale force wind blew snow in all directions, I found myself out on top of a pile of a hundred bales of hay trying to rope down a couple of tarps to keep the hay dry. It was a good moment for me, because it represented the first time I had gone at some crazy farm job without hovering family members afraid I might flip over another wheelbarrow. For some reason, this made me think you all might think that I was quiet on the blog because of lingering arm issues. 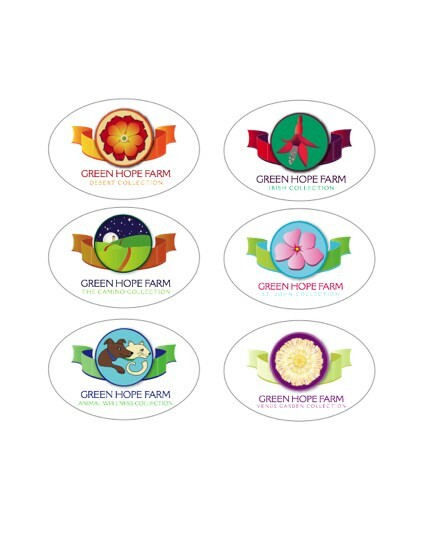 The actual reason for fewer blogs is that I have had my nose buried in the Green Hope Farm Flower Essence Guide rewrite all fall, and when I lift my head from this, it is because I am working with Jessica, our new staff goddess, on designing new labels for all our Flower Essence collections. The Guide rewrite is drawing to a close. I expect to get the document to the printer in early January. Information about all the collections is going in under the one roof of this book. The St. John Flower Essences, ALL the Irish Flower Essences, the new Camino Flower Essences and ALL the Desert Flower Essences will be included, as well as all the other collections that have long resided within its pages. Opening a box from us won’t be quite the flurry of loose papers it has been in the last few years and hopefully the more compact literature in the book will mean less trees going into our materials. Lots of the graphics in the Guide book will reflect Jessica’s work on our logos. We will mark each page of the Flower Essence description section of the Guide with the appropriate logo. We hope this will help everyone know where they are in the document. In general, I think it is going to be an easier guide to navigate ( yes, I know that is not hard to imagine). Jess has even talked me into things like putting the different collections in alphabetical order! As she simultaneously works with Ben to rebuild the web site, and bring order to my right brain guidebook, its hard not to miss how much better organized and easier to understand EVERYTHING is going to be thanks to Jessica. Right now, I am going through the guidebook to proofread my revisions. It’s always a great moment when I feel that a rewritten definition of an Essence expresses the Flower Essence’s strength and glory better than my last attempt- and there are lots of revisions that I feel are wonderful improvements, mostly because I have found some ways to cut to the chase. I also thought you might like another sneak peak at some of the new labels. You have seen the Desert collection label before on the blog. It is a Claret Cup Cactus, a wonderful desert mandala in its own right. I love how the whole label echoes the colors of the deserts of the southwest. The center of the Flower is green and this seemed so wonderfully symbolic of the Desert Essences that bring everything back towards healing. To the right is our Irish label. We tried many Irish Flowers before arriving at this label. Our attempts with Sea Campion were particularly earnest, but never led to anything that worked. When we tried Wild Fuschia, we loved the way it gave us an opportunity to bring in green, but not in a heavy handed way. We also love Wild Fuschia’s obvious joyfulness, as this is the way we feel about this collection. Next comes the Camino label. This one took a lot of time and went through many revisions. We wanted to indicate the metaphor of the trail as the spiritual journey we ALL walk whether we get to the Camino in Spain or not. We found that when we designed a label that had the trail moving straight from foreground to horizon as it did during so much of Lizzy’s walk, there was a bleak quality to the image. Playing with the path dipping in and out of sight suggested the adventure of life much better. We also added the moon, stars, and the tower of a building in the background to deepen the image. The building in particular is meant to suggest how much of a role human community plays in our spiritual journeys and how this, along with the eternal verities, is a focus of these Essences. Next to the Camino label is our label for the St. John collection. This was a hard label to do. We found that a lot of the Flowers we tried looked cliche. A bodacious babe sipping a pina colada while on spring break in Fort Lauderdale wasn’t quite the image we wanted to suggest. Eventually we settled on Madagascar Periwinkle for the Flower. We loved the way the colors of the whole label felt like tropical St. John and we felt that the power of this Flower Essence was a good representative for this great collection. We decided to play around with our Animal Wellness Collection label while keeping it pretty close to the original. We tried various colors schemes, but chose this one as the freshest. Jessica had hope to make the dog look like her black lab, Brody, but when we made the dog black, it was impossible to see the face on the dog. Brody will just have to star in some other publication of ours! The last label I have to share today ( there are actually four more, but I don’t have the right files to load them here) is the label for the Venus Garden Collection. This is a label of such incredible nuance thanks to Jess’s meticulous work on all the petals. The Flower is our much loved Mehera White Marigold. We think the label is elegant enough for this elegant powerhouse of a collection and of course, there is no Flower equal to Mehera! Right now we wait for press proofs on these labels. We expect to have them aboard and in use at the beginning of January. We sent label queen Lynn home yesterday with the admonition to REST YOUR HANDS! She is going to be very busy come the new year! Jess has built all these files in a format that means we can enlarge these labels to enormous banner size without pixilation- yet another phrase I never thought I would write- Anyways, we have had so many years of problems with labels, it is positively thrilling to have ones that I am confident will not give the printer nightmares! Can’t wait to share all these and more with you dear people! But how many times can a sit com writer come up with a fresh script about a Rhino that does dishes? 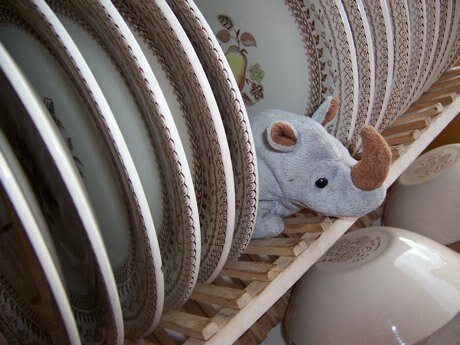 After just six episodes, Rhino’s TV show was cancelled by the Dish network and Rhino found himself back on the shelf, understandably a bit sulky that his fifteen minutes of fame was apparently up. Recently though, his people came by with some new concepts. His press rep told me Rhino’s show had been picked up for another season. It had been retooled with a new, sexier name, “In the Suds.” A reborn Rhino was ready to re-negotiate a deal with me to be featured in the blog again. Everything was set for Rhino’s return to blog fame when a major problem arose. With adult children and their friends filling the household over the long Thanksgiving break, Rhino watched a bit too much reality TV. I think it was maybe during a new episode of “The Hills” when Rhino set forth his deal breaker. He wants a soundtrack for his work on the blog. It wasn’t enough that his TV show had its own score. He wanted the music of undiscovered hip young bands for the blog soundtrack as well, and wouldn’t hear me out about how I hadn’t a clue how to discover hip new undiscovered bands. We seemed, once more, at a stalemate. But then, Thanksgiving dinner happened. 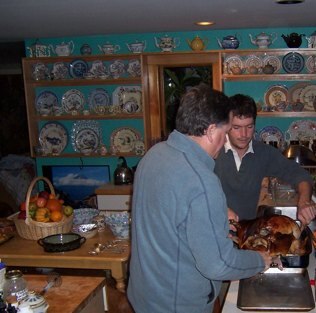 Is there any meal more about dishes than Thanksgiving dinner? It was a perfect storm of greasy turkey pans, mash potato crusted bowls and epic stacks of dinner plates, desert plates, glasses, silverware, pots and pans. Rhino found his best self in that moment. He rolled up his sleeves and started washing, without a camera crew and without a sound track. He did have some standards. Photo ops with him began only after the dishes were clean. Here Rhino watches from out of sight as the turkey is transfered from one dish to another and then another. We felt it was important to keep the flame burning on the Thanksgiving theme of endless dishes as well as keep the stakes high for Rhino’s success at the post meal sink. 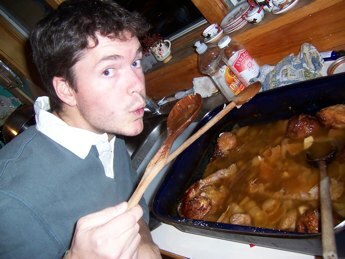 Ben out and out taunts Rhino with the challenge of the turkey roasting pan. Several hundred dishes later, Rhino shows why his career as a soap and water star lives on.